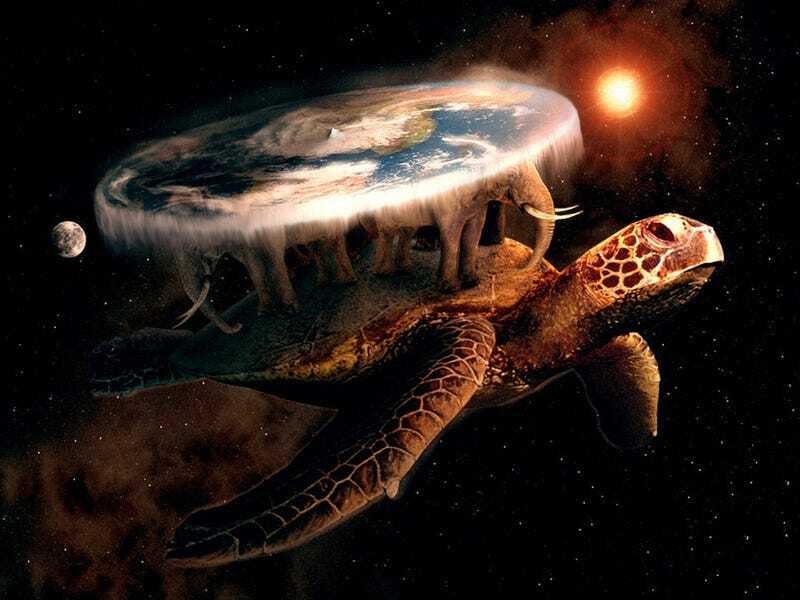 The world is flat, and resting on the backs of four elephants who, in turn, stand upon the back of a giant, space-faring turtle. Welcome to Terry Pratchett's Discworld. How does it all work? Pratchett, along with Professors Ian Stewart and Jack Cohen, explain it all in The Science of Discworld IV. Terry Pratchett, Jack Cohen and I recently completed the fourth book in the popular science series The Science of Discworld. The format of these books combines a fantasy short story, set in Terry’s Discworld, with scientific commentary about the real universe. Discworld runs on magic (things do what people want them to—if they know the right spells) and narrativium (things do what the story requires them to). It is flat, supported on four giant world-bearing elephants which stand on the back of an even larger space-faring turtle. The turtle swims through space, so it needs no further support. Our own universe, or ambiguously our planet, appears in the story as the Roundworld Project. This is a magical construct inside which magic does not work and the rules of science, the laws of nature, apply instead. The wizards of Discworld have a different idea from us regarding which world is real, but that’s their problem. They do find a world without magic puzzling: nothing seems to make sense. This format has some very useful features for writing popular accounts of science. The main one is that since the scientific action always takes place inside Roundworld, the scientific chapters are genuine real-world science. Additionally, any scientific topic might in principle be discussed. There is no limitation to ‘explaining’ Discworld fantasy elements in terms of science, which is how most ‘science of’ books—Star Trek, Harry Potter, The X-files, Santa Claus—go about this kind of mixture. So there’s no obstacle, in principle, to us eventually getting to The Science of Discworld 42, or whatever. In the first Science of Discworld, the wizards of Unseen University accidentally bring Roundworld into existence, and witness the origins of the universe, the solar system, the Earth, bacterial life, complex life and apes. They, unfortunately, fast-forward through the entire history of humanity, returning to Roundworld just in time to see something fleeing an approaching ice-age, leaving behind the wreckage of its space elevators. The second book of the series sees elves invade Roundworld and disturb the course of history. But when the wizards kick them out, humanity degenerates into a primitive state and nothing interesting happens. Eventually the wizards get William Shakespeare and Isaac Newton born, and the seeds of today’s world are re-established. The third Science of Discworld relates to how interference by the Auditors of Reality, the ultimate cosmic health-and-safety officers, get Charles Darwin to write the wrong book: The Ology of Species, not The Origin. The creative tensions and debates between science and religion, which occurred in Victorian times, never happen, and humanity falls into a state of comfortable complacency. Which means they will not be inventive enough to escape that coming ice age. With difficulty, the wizards get Roundworld back on track. The fourth, and most recent, book in the series hinges upon events in Discworld rather than Roundworld. On the Disc there is an ancient religion, Omnianism, which believes Discworld is round. Despite all the evidence, they do not believe in the turtle or the elephants. Seeing the Roundworld Project as an infringement of their theological property rights, they launch a legal case to gain custody. Naturally, the wizards dispute their claim. This scenario allows us to examine, in the science chapters, a variety of issues. In particular, we look at how scientists can try to infer the shape of their world, or the universe itself, when they are unable to get outside it and take a direct look. For the Earth, we can now do that, but scientists mapped out the entire planet long before we could get into orbit. We still don’t have that luxury for the universe as a whole, and it’s hard to see how we could ever get it. The commentary discusses a key feature of science, one that many non-scientists fail to appreciate: science is mainly about inference from experiments and theories, not direct observation. The ancient Greeks inferred the spherical form of the Earth thousands of years ago, by logical inference from phenomena that they could observe, such as the planet’s shadow on the Moon during an eclipse and the way boats seemed to sink below the horizon as they headed out to sea. Today we infer the temperature at the centre of the sun from our understanding of nuclear reactions, but no person or instrument has ever been there to check. The majority of scientific knowledge rests on inference, not on direct observation. Indeed, that’s what theories are for. The topic that we deleted concerned the short-lived hypothesis that the Earth might be expanding. On the Beagle voyage, Charles Darwin observed fossil shells at high altitudes, showing that the Andes mountains had been uplifted though thousands of metres. He suggested that this might be explained if the Earth were expanding, but he quickly changed his mind, proposing instead that as some land rose, parts of the seabed descended to compensate. Several early geologists noticed the way the west coast of Africa resembles the east coast of South America, suggesting that those continents have moved apart. Roberto Mantovani explained this as the effect of the Earth expanding, so that its surface area increased. Continental rocks of fixed area would necessarily break up, and the pieces would move apart. In 1889 and 1909, he proposed that originally the planet’s entire surface was covered in a shell of rock. Internal heating caused the planet to expand, and the expansion was fastest at the ‘rip zones’ down the middle of the oceans. This led to today’s geographical distribution of land and ocean. The ring of fire round the Pacific ocean, riddled with volcanoes, could be explained in a similar manner. The contracting Earth hypothesis is now considered disproved, by a variety of evidence. In particular we now know that radioactive elements inside the Earth provide a significant source of heat. And the occurrence of the same fossil species on either side of the Atlantic argues against contraction. Oddly, some geological (‘hermeological’?) features of the planet Mercury, namely cliffs, are currently explained by global cooling, and the same goes for comparable features on the Moon. Neither body has a source of internal heat that is comparable to the Earth’s. Expanding Earth theories bear some resemblance to Alfred Wegener’s continental drift, and seek to explain the same features. But Wegener did not think the planet was getting bigger. The discovery that the Earth’s surface is composed of gigantic, moving tectonic plates provided a credible mechanism for Wegener’s idea. Before the plates were found, continental drift was generally held to be at least as absurd as an expanding or contracting Earth. Perhaps ironically, today’s cosmologists have found strong evidence that the entire universe is expanding. It’s pretty convincing, but there are some loopholes and some inconvenient observations that cast a small amount of doubt on current proposals for how the expansion got started and how it subsequently developed. Maybe in the future an expanding universe hypothesis will seem just as absurd as an expanding Earth. I think that’s wildly unlikely, but because the expanding universe theory rests on inference from something that happened over 13 billion years ago, I wouldn’t rule it out completely. Maybe we should send the wizards back to find out. This article was originally published on The University of Warwick’s Knowledge Centre and is reproduced here with their permission.